Ambrosia Farm is a family run market garden operated by Brandon and Phaedra Jackson. We have been farming for eight seasons now, and are presently in our fourth year in the Veneta area just 25 minutes west of Eugene. 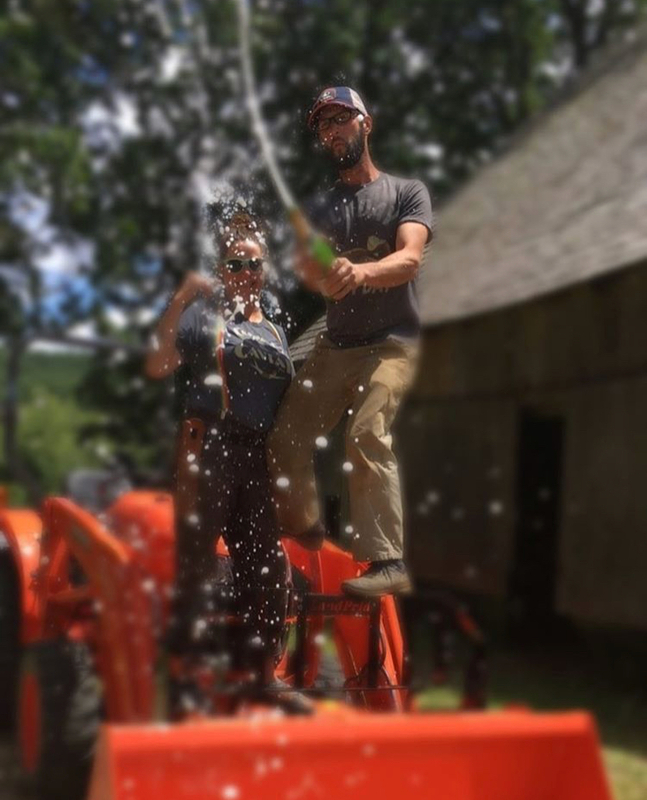 Keeping with modern small scale farming practices, Ambrosia Farm grows on 1.5 acres of land, using primarily a BCS and Compact Tractor for machinery. In the past we have always hired two employees throughout the growing season, and a couple of high school helpers during harvest. This will be our very first year joining RFC as a host farm. A respectable CSA program, Farmers Markets and a small amount of wholesale are our primary sales outlets. In the past, U-Pick berries and produce had been a major focus, but this has been replaced by offering a unique spin on the U-Pick concept and opening up the gates for a unique U-Pick CSA. In keeping with quality standards that produce from the Willamette Valley is known for, Ambrosia Farm grows all crops under the same standards of organic certification requirements, but does not maintain a certification. Growing practices and techniques here are more geared towards small scale, local, intensive agriculture. Interns that join us will be trained to become the next generation of small scale farmers. This type of education is a learning process that covers wide variety of aspects, but the patience needed to do so over a full growing season. Our expectation is that you are coming to Ambrosia Farm with the intention of one day starting your own operation. As the season progresses, new skills and tasks will be addressed, along with all necessary training along the way. After the initial 45 day trial period, you will be given more responsibilities in the operation as appropriate. Our season begins on April 1st and will continue through October 31st. Farming hours are tricky and rely primarily on daylight and growth cycles. Interns will be expected to train 32 hrs (four days a week, 8hrs/day) during April and May. From June through September, we require 40 hrs (four days a week, 10hrs/day), and back to 32hrs/wk in October. As farmers ourselves, we strive to work more efficiently and avoid the “Dawn to Dusk” farm day. Every year presents new areas of improvement in growing practices. As the season unfolds, situational awareness, communication and initiative are necessary for the farm crew to enjoy a successful season. Unlike larger farms that have several acres of production, the scale of working on 1.5 acres keeps the monotony of long harvests and grueling back breaking labor to a minimum. This style of agriculture is as close to the romanticized dream as we know. April: Training and Introduction to Ambrosia Farm, Potted Plant Sale, Bed Prep, Direct Seeding, Transplanting, Cultivation, Irrigation Work, Trellising, Row Fabric Setup. We have also just transitioned to a new farm property and will be building greenhouses as well. May-September: CSA & Farmers Markets, LOTS of Harvest, Bed Prep, Direct Seeding, Transplanting, and so much more. Time off will be accommodated to allow for Rogue Farm Corps meetings and enjoying three days off every week is encouraged. In addition to training in the farm operation, we are happy to share with you the business aspect of farming, beyond the expected field hours. This includes crop planning, accounting, budgeting, marketing, crop planning and more. As tenant farmers, we do not have access to live on the land we are currently leasing. Unfortunately, housing is not an option that we can offer, as we ourselves do not even live here. Only 10 minutes away is the small town of Veneta, and Ambrosia Farm is located just 25 minutes west of Eugene at the base of Sarver Winery. Local housing in either town should be easy enough to come by and we have included an additional housing stipend to assist with making this internship possible. Every week our interns will receive a CSA box of produce to enjoy. Bulk foods such as beans, rice, flour, and spices are made available as well. We do not raise animals, but are connected with locally sourced eggs that are reasonably priced. Additional details of the stipend and housing will be discussed during the interview process. Interns seeking education with Ambrosia Farm need to take this experience seriously as we are running a farm, but this is also a business and should be conducted professionally as such. Truly, we are seeking two interns that want to become the next generation of farmers, and we are excited to train you on everything we have learned over the last seven years. Our expectation is that interns with Ambrosia Farm show up every week from April through October. Please keep yourself in good physical condition as this job is very demanding on the body as the season progresses. Humility is expected throughout this internship and the ability to be open to positive criticism. More often than not, you’ll be told what you’re doing right, as opposed to what you are doing wrong. Additionally, we expect you to conduct yourself as an adult that is comfortable with direct and open communication. Farming may be a whole new experience for you, but humanity has been growing food for over 12,000 years… Remember, you got this.